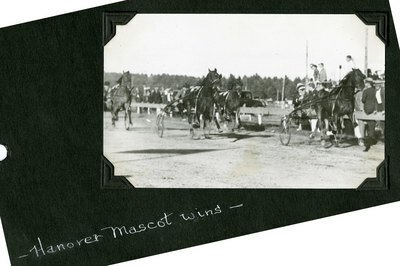 Black and white action photo of the end of the seventh race of the Cumberland Farmers' Club Fair, West Cumberland, Maine on Tuesday, September 17, 1935. Hanover Mascot won this final heat of the 2.24 Trot. Aura finished the contest in second place. Czar Bingen finished in third.